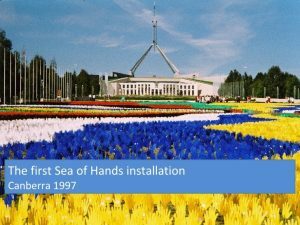 Twenty years ago, the first Sea of Hands was installed at Parliament House in Canberra. ANTaR started with – as indicated in the original acronym – a focus on native title and reconciliation. Twenty years on, there have been gains and frustrations for Australia’s first peoples. There was despair around the Northern Territory intervention. There was a time of hope with the apology to the Stolen Generation in 2008. Discussion around constitutional change and recognition revealed the need for the next steps to be significant and meaningful. And so we have come to the Uluru Statement from the Heart, giving substance to the voice of Aboriginal and Torres Strait Islander people from across Australia. This year, the David Hunter Memorial Lecture will feature speakers who can reflect on the issues from 20 years ago that inspired the first Sea of Hands, as well as speakers who are taking the next steps through the Uluru Statement. There will be a Sea of Hands display and the opportunity to sign a hand and show support for the continuing work. Please let us know if you would like to share stories or memorabilia relating to the first Sea of Hands.